How would I know that Constitutional amendments were ratified on certain dates? What evidence would I have? For example, a search result from the Library of Congress website states that the 15th Amendment was ratified on Feb 3, 1870. But why should I believe it? After all, the search result also says that Secretary of State Hamilton Fish issued a proclamation of the 15th Amendment on March 30, 1870 (not Feb 3, 1870), and that the public began to recognize the amendment afterwards. The Article V of the Constitution says that a proposed amendment is ratified when 3/4 of the states approve it. So then, shouldn't there be a record of someone officially validating the 3/4 poll of the states? The particular discrepancy in the 15th amendment is between when the 28th state (of 37) ratified it pushing it over the 3/4 necessary, and when that ratification was certified by the US Secretary of State. Iowa became the 28th on Feb 3rd, and the Secretary certified it on March 30th. The secretary's certification was unnecessary. An amendment goes into effect the moment the final state ratification pushes it over the edge. This was upheld in DILLON v GLOSS. The provisions of the act which the petitioner was charged with violating and under which he was arrested (title 2, §§ 3, 26) were by the terms of the act (title 3, § 21) to be in force from and after the date when the Eighteenth Amendment should go into effect, and the latter by its own terms was to go into effect one year after being ratified. Its ratification, of which we take judicial notice, was consummated January 16, 1919. That the Secretary of State did not proclaim its ratification until January 29, 1919, is not material, for the date of its consummation, and not that on which it is proclaimed, controls. As for the evidence, presumably someone, somewhere has the original ratification documents in storage. Probably the US National Archives or the Iowa State Archives. 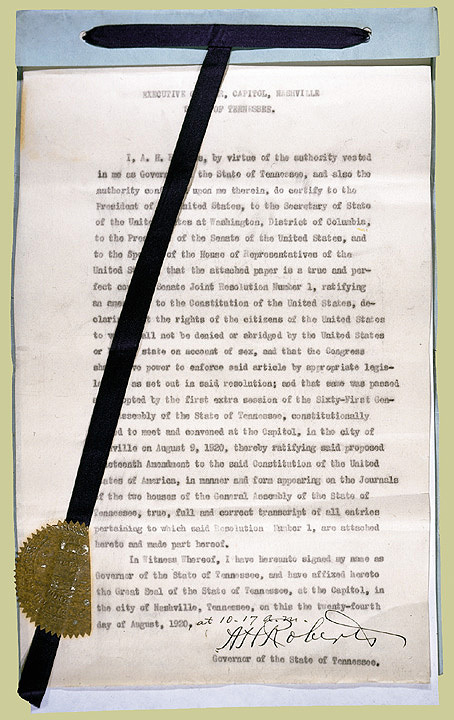 Here's an example, Tennessee ratifying the 19th amendment, that was put on exhibit. Why did Jefferson have to 'Stretch the Constitutional Breaking Point' for the Louisiana Purchase? Federalist #68: What other writings from the Constitutional Convention corroberate or dispute this definition of the duties of electors? I'm trying to find a primary source (or some historical authentication) for John Quincy Adams' Toledo War quote.